The Global Volcanism Program has no activity reports for Akusekijima. The Global Volcanism Program has no Weekly Reports available for Akusekijima. The Global Volcanism Program has no Bulletin Reports available for Akusekijima. Akusekijima is a small stratovolcano in the southern Ryukyu Islands. Most of the island is surrounded by steep cliffs, and beaches are found only on the SW and SE sides. The andesitic-dacitic volcano consists of two older somma volcanoes, Biroyama and Nakadake. Mitake lava dome forms the high point of the small 2.5 x 3.2 km wide island. The dacitic Omune lava flow on the NE flank was K-Ar dated at less than 80,000 years Before Present; its youthful morphology and lack of overlying tephra layers suggests it could be as young as the Holocene (Furuyama et al., 2002). The lava flow, the youngest product of the volcano, forms a low-angle plateau overlying cliffs forming the northern coast. Furuyama K, Daishi M, Nagao K, Eguchi M, 2002. The discovery of young dacite lava in Akuseki-jima Island, Tokara Islands, Japan. Bull Volc Soc Japan (Kazan), 47: 751-755. The Global Volcanism Program is not aware of any Holocene eruptions from Akusekijima. If this volcano has had large eruptions (VEI >= 4) prior to 10,000 years ago, information might be found on the Akusekijima page in the LaMEVE (Large Magnitude Explosive Volcanic Eruptions) database, a part of the Volcano Global Risk Identification and Analysis Project (VOGRIPA). There is no Deformation History data available for Akusekijima. There is no Emissions History data available for Akusekijima. 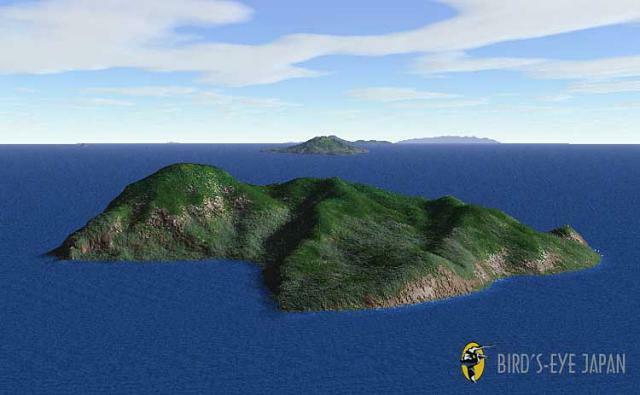 The island of Akuseki-jima is seen in an aerial perspective from the SW looking along the Ryukyu Island chain in this computer-generated graphic image. The high point of the island is 586-m-high Mitake (left). Suwanose-jima is the next volcano to the NE, and Nakano-shima lies on the far right horizon. Photo courtesy of Bird's-Eye Japan (http://www.medianetjapan.com/2/town/internet_computer/birds/). Akuseki-jima is seen from the north with the Omune lava flow forming a plateau in the foreground. The dacitic lava flow, the youngest product of the volcano, has a youthful morphology and lacks overlying tephra layers, suggesting a young age. 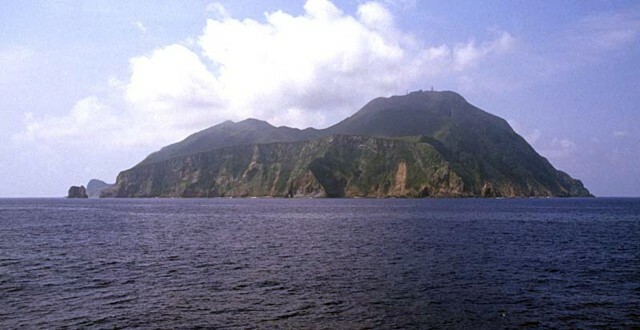 Akuseki-jima is a small, 584-m-high stratovolcano in the southern Ryukyu Islands that consists of two older somma volcanoes, Biro-yama and Naka-dake. Mi-take lava dome (right) forms the high point of the small 2.5 x 3.2 km wide island. Copyrighted photo by Shun Nakano, 2004 (Japanese Quaternary Volcanoes database, RIODB, http://riodb02.ibase.aist.go.jp/strata/VOL_JP/EN/index.htm and Geol Surv Japan, AIST, http://www.gsj.jp/). There are no samples for Akusekijima in the Smithsonian's NMNH Department of Mineral Sciences Rock and Ore collection. Large Eruptions of Akusekijima Information about large Quaternary eruptions (VEI >= 4) is cataloged in the Large Magnitude Explosive Volcanic Eruptions (LaMEVE) database of the Volcano Global Risk Identification and Analysis Project (VOGRIPA).